After a short night and only one cup of coffee in my hostel I started my way to the Marina Bay. Marina Bay is a bay near Central Area in the southern part of Singapore, and lies to the east of the Downtown Core. 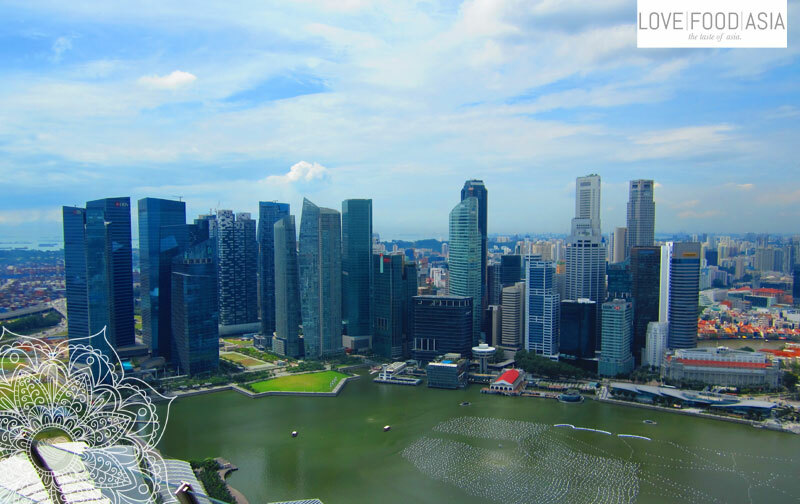 The area surrounding the bay itself, also called Marina Bay, is a 360 hectare extension to the adjacent Central Business District. It was the first stopp on my “Main Attractions” tour in Singapore for today. After a short stop in Chinatown I bought my ticked to visit the roof top of the Marina Bay Sands Hotel. The 20 S$ are absolutely worth it to visit. The fabulous view is amazing. But also the view from the ground is impressive. The architecture of the Marina Bay Sands with it´s swimming pool on top is unique. From there I walked (just a few steps) over to the Gardens by the Bay. This area is a big plant and garden park where the entrance is free. But the main attraction is the Flowerdome and the Cloud Forest. Both attractions are a must see in Singapore and you have to pay 28 S$ to visit them. The flowerdome also was full with Christmas flowers. Like in many places in the city you can see that all the people here love Christmas. You can hear Christmas songs everywhere in the city center. And you are surrounded by flashing Christmas lights. After a short break I met with Pecillius at the Clarke Quay and we went to have dinner at the Jumbo Seafood Restaurant. She was happy that she could order for me to show me all the different super delicious meals. I forced myself to eat everything but it was impossible. We had the original Singapore Crab (Incredibly amazing). Venison (deer meat) with ginger and spring onion. Stir fried broccoli with scallops. Fried deshelled prawn with cereal. Then it was time to say goodbye to Pecilius and I was delighted that I could visit Singapore with a friend. We promised to keep it touch and so we did until now. I had a long walk back to my hostel. I still could feel my filled stomach. I heavily felt to bed and thought about my next day. The way to Malaka, Malaysia. I hope I can go to these wonderful parts of Asia some day.